The precedent-setting day will be Sunday May 21, coinciding with the PokerStars Spring Championship of Online Poker (SCOOP) Main Event. At least two players will become millionaires as a result of two tournaments with guaranteed first-prize of at least $1 million. 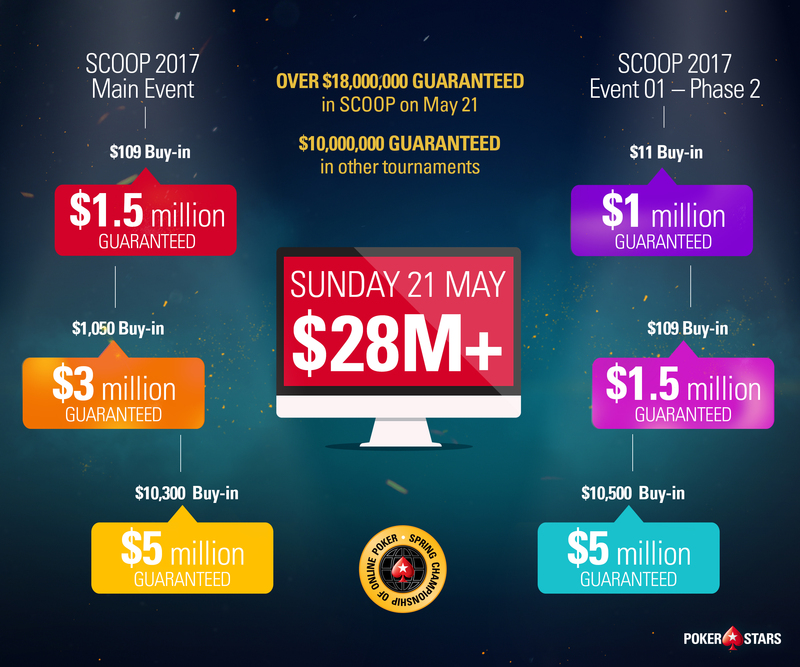 The 15 SCOOP events on Sunday guarantee $18 million alone and with SCOOP buy-ins from $5.50 to $10,300, there’s a tournament for everyone, including special $25 Spin & Go’s that are awarding players a $10,300 seat into the high-stakes Main Event. Event-01 Phase 2 (Medium) has already exceeded its guarantee and the prize pool stands at more than $2 million. The Sunday Storm also runs with a $250,000 guaranteed prize pool. Satellites and smaller tournaments run with buy-ins from $0.01. What could $28 million buy you? SCOOP has already awarded $59 million across the series so far. The biggest SCOOP 2017 winner so far is ‘BIack88’ who won $702,658.75 in Event 15-H the 8-max High Roller NLHE, while ‘fityfmi’ scooped $141,972.57 from a buy-in of $215 in the low-stakes edition of Event 15.